The Box Office is located in the West Lobby just across from the Theatre. From the South - Take I-15 North to I-80 East then take the State Street Exit. Drive north on State Street approximately 1 mile to 1700 South. 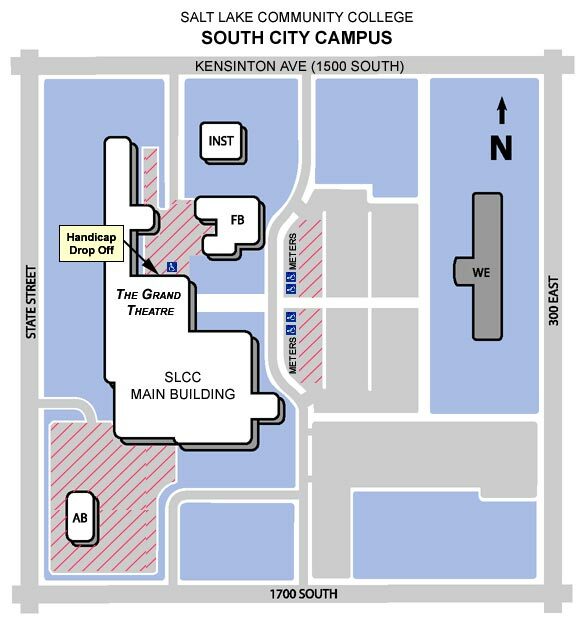 Turn right on 1700 South and follow signs to Salt Lake Community College parking. From the North - Take I-15 South to the 1300 South/2100 South exit. Turn left on 1300 South and continue to State Street. 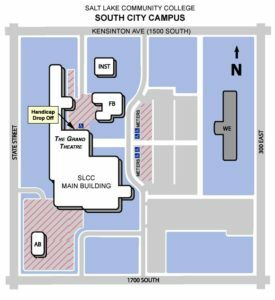 Turn right on State Street, then left on 1500 South and follow signs to Salt Lake Community College parking. Theatre Parking is available at no charge in Student Parking areas on the east side of the building. The parking area is patrolled by SLCC Security Officers for safety. There are limited handicap parking stalls on the north side of the Theatre building and several more along the first row of the student parking area. Patrons who are unable to walk from the parking area to the Theatre may be dropped off and picked up at the doors to the building on the north side of the Theatre. Warning: Theatre patrons parking in Faculty or Disabled Parking areas without an appropriate permit will be ticketed by SLCC Security Officers.